Now I have done my share to make Capital in the Twenty-First Century by Thomas Piketty a little less unread. Good timing, since he is visiting Oslo this week. What I will write here will be the notes I took while reading the book, edited for clarity. It is well known now that the book is thick and contains very much information, Piketty explicitly wants to consider both big and small phenomena, both long and short term changes, hence disclaimer: There will inevitably be much that I will not have caught or write about, and there may also be things that I have misunderstood. But maybe these notes will be helpful for those who have themselves read parts of the book or know a little bit and are trying to understand more. Many others have written better proper reviews. Conclusion: Much great empirics to learn from. Inequality is an important topic. Good figures. Good at using qualifications and caveats, necessary when writing such a broad book. Good that also tries to explain. 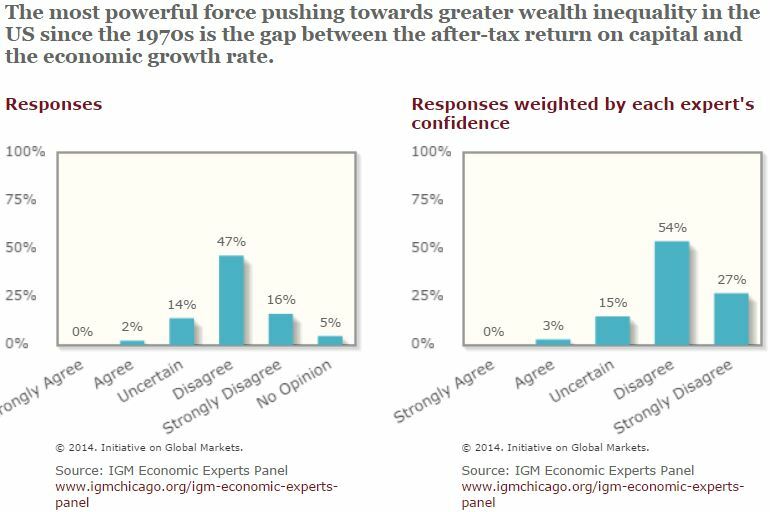 Objections by others that the recent rise in inequality is caused by human capital, etc. are misguided. Fundamentals of and cause and effect relationships in theoretical framework should have been clearer, and objections often relevant. Recommended. -Focus on US and France, to some extent Germany, Britain, and to a lesser extent Sweden. -Convinced that inherited wealth will make a comeback. -The capital/income ratio is defined as β = K/I. It is fine to call and think of capital as “wealth”. This ratio was quite high in the time around 1900 (about 7), meaning that there was a lot more wealth than income. This was a period with very high inequality, particularly in Europe. But with depressions and world wars, much capital was destroyed, thus β declined. In the post-war period, β has been rising again. -The second law: β = s/g. s is saving. Also like an accounting identity. Supposed to hold asymptotically. -Capital ownership is concentrated, so a high capital/income ratio is typically related to inequalty. -Suggests competition between nations-> conservative revolution, Thatcher etc. -Piketty emphasizes both that the capital/income ratio has increased and that inequality has increased since the world wars, and that r>g is a force for greater inequality, but he stresses repeatedly and clearly that r>g is not what is driving this recent rise in inequality. So people saying things like “Piketty is wrong because he claims that the rise in inequality is due to capital income while in truth it is due to a rise in wage inequality” (a group including notables such as Debraj Ray) simply cannot have read the book seriously. Indeed the point of a rise in wage inequality is treated at considerable length and referred to repeatedly. I have mentioned this before. -On the other hand, his use of the “second law” β = s/g is a legitimate target for criticism, since he writes as if s and g are exogenous and independent variables determining the capital/income ratio, which is clearly not the case. -The fundamental force for divergence: r > g. This has more bite than the “laws”. Piketty takes it as an empirical fact that the rate of return on capital, r, historically has been greater than economic growth g. In his view, the second half of the 20th century, in which the opposite was the case is an exception. Debraj Ray has forcefully attacked the emphasis on this inequality, pointing out that it is the saving propensities of the rich versus the poor that matters, not the form of their saving (here and here). -Piketty refers to 19th century literature throughout, but he does so to show certain features of the economic environment: in the novels of that time there was no inflation; and the rate of return on capital was constant – capital and rent of ca 5% considered the same, and type of capital seen as unimportant (p 207). -Most wealth privately held, tab 3.1. -p 151 strange about “inevitably” about volume and price effects in housing. -p 163 takes swipe at authors of wb reports regarding monetary value of hum cap. -Volume effects, like savings, together with slow growth explaining most (though not all) of increase in private cap from 1970s. Ex of second law. Privatization also a cause, and increase in asset prices. Might one make the arg that privatization increased value? Higher value placed on the privately held capital. -Rate of return depending on size of capital. I come back to this under Part three. -p 220: “the novelty of this study…capital-labor split and the recent increase of capital’s share of national income in a broader historical context by focusing on the evolution of the capital/income ratio from the eighteenth century until now”. -Acknowledges role of recent prod growth and diffusion of knowledge – have made it possible to avoid the apocalypse predicted by Marx (p. 234). But has not altered the deep structures of capital. Also sees “progressive taxes on income and inheritance (p. 278)” in the postwar period as reasons why rentiers have not come back. -Destruction of war, bankruptcies in depression an policies like rent control reduced wealth inequality, allowed new start. -France: large decrease in inequality since the Belle Époque, driven by income from capital (figs 8.1-2). Increase after WWII, due to both capital and labor, decrease from 1968, when minimum wage was increased faster than the average wage, then increase from 1982-83, when this policy was stopped. Overall, though, wage inequality stayed about the same, but increased at top end of the distribution since 1990’s. -US: started the 20th century as more egalitarian than France and Europe, but has now overtaken them and become as unequal as France was at that time (fig 8.7). Decreased in prewar and WWII times, but has shot up sine the 70’s due to the rise of “supersalaries” going the top 1 percent income receivers (fig 8.8). -The very rich still get most of their income from capital in both France and US. Figs 8.3-4 and 8.9-10. -Also consider other countries. Many of the same developments. -Thinks we are not going away from society of rentiers, only going to another form. Agrees with Goldin and Katz that increased spending on education would be good, but considers the wage-according-to-skill-only-story, or the theory of marginal productivity, as incomplete, since “it fails to explain the diversity of the wage distributions we observe in different countries at different times (p. 308)”, sees it rather as holding in the long run. Also mentions the intrinsic value of health and education. In the US the minimum wage has gone in the opposite way as in France (fig 9.1). Minimum wage can be efficient if firms have monopoly power, this is its justification. Hard to see differences in objective measures if skill between top and almost top income earners; supermanagers emerged mostly in Anglo-Saxon countries, but not other developed countries. Social norms and acceptability. Difficult to explain observed pay differences by non-external variances-“pay for luck” present, and more so in countries with lower top marginal tax rate. Bargaining model-with lower marginal taxes, it paid for executives to bargain harder. -Wealth more concentrated. Data go longer back. Wealth inequality decreased substantially in the first half of the 20th century, some wealth going to “the patrimonial middle class”, the middle 40% of the wealth hierarchy. Decrease largely due to the shocks of 1914-45 and introduction of taxes on capital and capital income. -Predicts that r will again rise above g, but says at the same time that this prediction rests on the assumption “that no significant political reaction will alter the course of capitalism and financial globalization over the course of the next two centuries (p. 358),” which is dubious “precisely because it’s inegalitarian consequences would be considerable and would probably not be tolerated indefinitely (p. 358).” This feels somewhat like overhedgning. -Demographics also relevant. And international competition may drive capital taxes down. “Nearly all of the capital stock came from inheritance (p. 379)”. Drop after the war, but steady increasing (fig 11.1) in France. Can be seen as result of three u-shaped forces: capital/income ratio, mortality rate, wealth at death/average wealth. Shocks of 20th century relevant also here-destruction if what was to be inherited, and many died young. Even if people are paid according to merit, income inequality will turn into inheritance inequality. (Andrew Gelman has an old post related to this). Difference from before: wealth less concentrated, and income and wealth more correlated. Similar patterns in some other countries as in France, but data difficulties in many countries, so uncertain. Also uncertainties about savings and consumption behaviors. -Share of billionaires in the work is increasing (figs 12.1-2). -Rate of return depending positively on wealth, ref Forbes rankings, table 12.1. -University endowments, for which we have good data, also show high return and positive association between wealth and return (fig 12.2). Piketty believes this is due to “economies of scale in portfolio management (p. 450)”. Here the evidence does not seem so strong, and it is difficult to believe that capital owners would not run into diminishing returns at some point. -I do not have so much to say about this one. -The state more involved today than in the past. Taxes increased between 1910 and 1980, after that constant (fig 13.1). Social spending-construction of a “social state”. Mobility relatively low in the US, and “parents’ income has become an almost perfect predictor of university access (p. 485).” Argues for more public financing of universities. Pay-as-you-go retirement systems connect generations and “makes for a virtuous and harmonious society (p. 488),” but face challenges when r becomes > g, which is the rate of return for these systems. Claims that the volatility of the return in capital was the reason for the introduction of paygo systems after WWII, when many people’s savings had been wiped out (p. 633n45), something I never learned about, and that this justification is still valid today. So how to deal with the challenges of r>g? Raising retirement age is one possibility, but we should be better at distinguishing between types of workers (intellectual occupations and others). Mentions possibility that share of intellectual workers will increase; and “One of the most important reforms the twenty-first century social state needs to make is to establish a unified retirement scheme based on individual accounts with equal rights for everyone, no matter how complex one’s career path.”-too many different rules and too much complexity. Sees the Swedish reforms of the 90’s as largely accomplishing this (p. 490n46). -Progressive taxes on income and inheritances new in the 20th century. Dismisses a direct tax on consumption quickly (p. 494), promising to come back to it (634n1), but hardly does (only briefly in 638n34). Rise of tax competition among countries, the tax system becoming regressive at the high end of the distribution. Sees this as threatening the common supper for taxation. US and Britain led the introduction of progressive taxes on income and inheritances, and had higher rates than France and Germany (figs 14.1-2). So high (marginal) rates that the purpose was not to raise revenue, but rather to limit such wealth. Rates substantially reduced since 80’s. Do not see effect on productivity, but believes the reduction increased the bargaining power of executives. -Wants economists to become more broad social scientists. Disses mathematical economists, then says that we cannot spend time on internal squabbles. I happen to agree w much of this, but it could maybe have been put differently. 621n57 taxi problem in the EU. 624n20 A&R on Gates and Slim. Also in text, but continues in the footnote. This entry was posted in Data, Economics and tagged books, capital, data, economics, income, inequality, Piketty, review, taxes, wealth on 2014-12-11 by Oeystein Hernaes. So why did the IGM ask this question in the first place? And why have so many economists been concerned with it? It is of course possible that they have not read the book. However it might also be the case that Piketty must take some of the blame and that in general it was not so clear in the book. At least the back cover text (on Amazon) is pretty ambiguous (though I hope the critics read more than that). I should maybe disclose at this point that I have not read Capital in the Twenty-First Century either , although now I might have to. This entry was posted in Books, Economics, Politics and tagged books, economics, income, inequality, politics, wealth on 2014-10-16 by Oeystein Hernaes.